This opportunity provides a capability to users to falsify the dimensional requirements of any model feature on a drawing but go undetected by Highlight by Attributes or ModelCHECK. 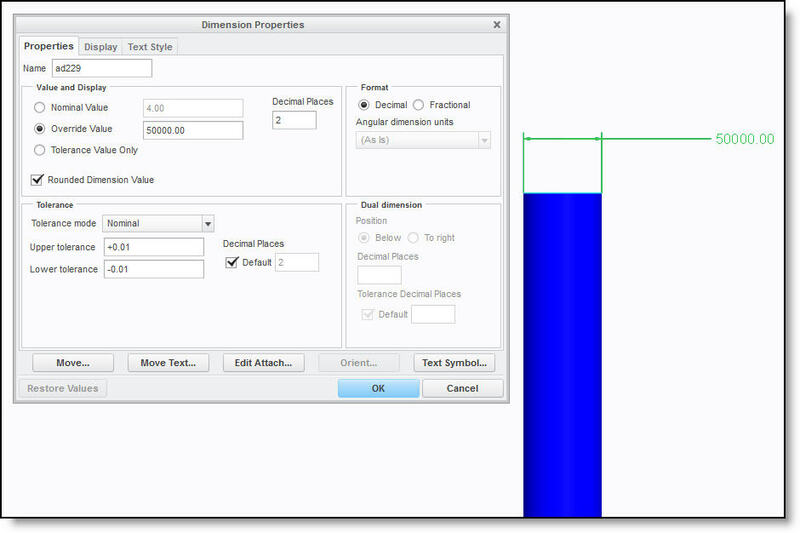 Model CHECK does not find these dimensions as “overridden/faked” as the properties tool does not insert a “@O” into the dimension typical of past overridden dimensions. Is there a way to disallow the use of this dim. Property option? What is the catch if users embed these “false” dimensions into drawings? It looks like this can also be done in 3D annotations that are created dimensions. I do not understand the need for this functionality. If PTC is pushing the MBE and MBD concept why would they make it so easy for model creators to "falsify" their designs and so hard for anyone else to identify. IF this function is needed why not make it obvious to the viewer that the dimension is "faked" by highlighting it in red (or some other color) or changing the font? Why enable the system to support bad practices? I can understand why you would want to be able to easliy identify why dimensions have been faked, but having history files that are visually correct, you don't want to send these files out of spec unless your ready to correct them all. But when you are ready, you should be easily able to check something on individual drawings or a group that would allow you to see the overrides. 18 months later, is there any change to this? Is there a config option that can disable this override selection?